With four main essential functional survival parts in one tool, it is more convenient to carry and use. It saves a lot of space and is very portable. High Quality Magnesium Flint Rod The magnesium flint rod is in high quality, it is very easy to use to ignite and produce sparks. Besides, it is changeable, so if it is used up, you can add a new piece. Total length: 138mm/5.4inch; Length of the scraper: 28.2mm/0.06inch. Net Weight: 38.6g/0.09lb; Gross Weight: 80g/0.18lb. Main Material: high quality aircraft aluminum, high quality steel, magnesium rob. 1.Scrape the magnesium fire starter rod with the scraper to clean off its surface black protective coating. 2.Prepare the cotton tinder, then pull it apart and put it next to the magnesium rod. 3.Put the rod in the center of the cotton, scrape it hard by the scraper to create sparks fastly landing on the tinder. It will be much better to hold the scraper at a 45 degree angle. 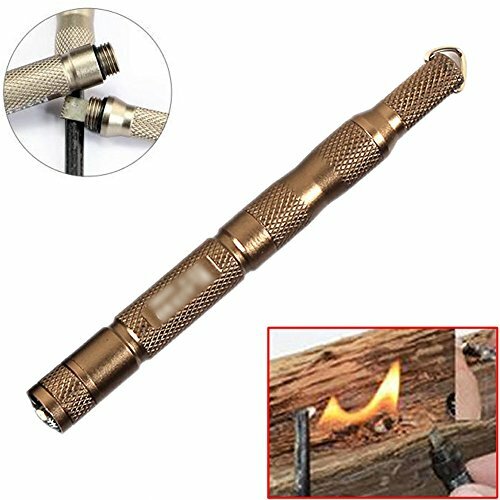 Don't be without the most important survival tool, a FIRE STARTER! Great addition for a backpacking emergency kit.